A worthy heir to Isak Dinesen and Beryl Markham, Alexandra Fuller shares visceral memories of her childhood in Africa, and of her headstrong, unforgettable mother. Though it is a diary of an unruly life in an often inhospitable place, Don't Let's Go to the Dogs Tonight is suffused with Fuller's endearing ability to find laughter, even when there is little to celebrate. Fuller's debut is unsentimental and unflinching but always captivating. In wry and sometimes hilarious prose, she stares down disaster and looks back with rage and love at the life of an extraordinary family in an extraordinary time. 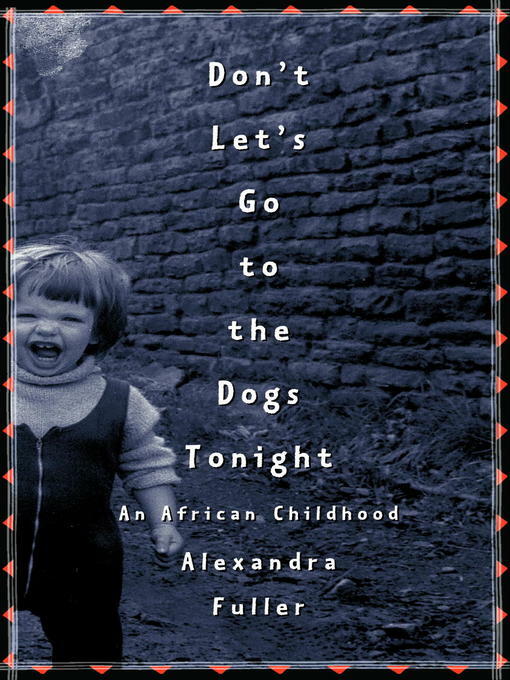 Alexandra Fuller writes poignantly about a girl becoming a woman and a writer against a backdrop of unrest, not just in her country but in her home. But Don't Let's Go to the Dogs Tonight is more than a survivor's story. It is the story of one woman's unbreakable bond with a continent and the people who inhabit it, a portrait lovingly realized and deeply felt.